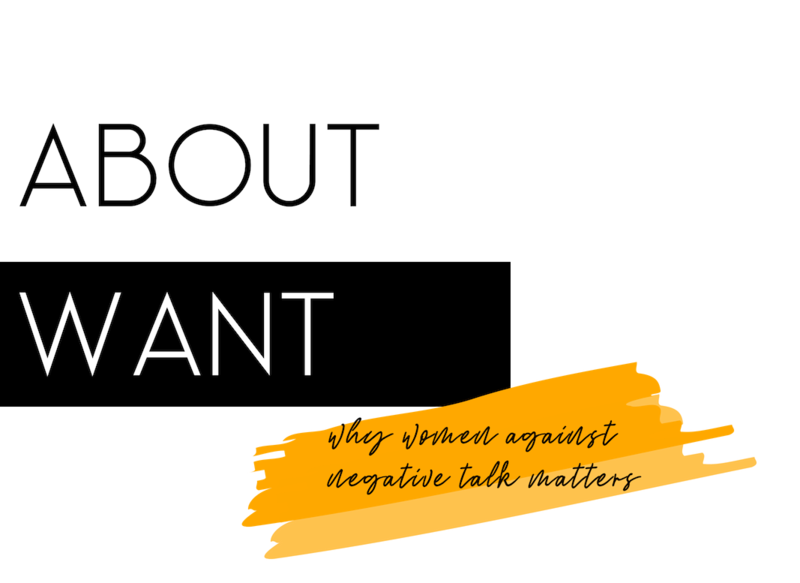 Women Against Negative Talk gives women tips, tools, insight, and inspiration to shift their negative self-talk patterns so that they can move forward fearlessly and live a life that’s ALL their own. Self talk isn’t inherently good or bad – it’s information. It’s a language we teach ourselves and a muscle we develop. WE get to choose whether we develop it positively or negatively. WE get to decide whether the language we learn is proactive, or reactive. what it means to want your self. WANT helps you learn the language you actually WANT to be speaking in life, to yourself and to others, instead of the language you didn’t even know you’d learned along the way. You WANT to change the world? Start by changing YOUR world. Move forward fearlessly. Spread the (good) word. And be the you YOU KNOW you’re meant to be. WANT was first conceived in November of 2007 by writer and speaker Katie Horwitch. Self image issues amongst women were just starting to push their way to the front of the line in the trending conversations going on in print, visual, and digital media at the time. What was once a taboo topic was now gaining a little traction – only a little, but traction nonetheless. After trial, error, and years of stewing (the think-y kind, not the soup-y kind) WANT came to life when Katie realized that there were zero outlets that not only gave women the inspirational-yet-authentically-human role models and real-life examples they were starved for…but actual pragmatic, proactive tips and tools to shift their harmful self-talk patterns and perspectives into ones that would finally allow them to be those inspirational and authentically human role models for themselves. Trending positive affirmations like “Speak positively about yourself,” “Choose to be happy,” or “Love the body you’re in” are nice and a step in the right direction, but WANT was created out of the realization that there needs to be more. Positive phrases won’t cut it in the long run without a solid framework for how to make them work on a personal and individualized basis. WANT recognizes the effects of negative self-talk, internal and external, on the mind, on the body, in the workplace, in the world. It’s a place to move forward fearlessly into the person you are meant to be by shifting both big and small things – everything from the way you approach self-care and identify the things you stand for, to the way you think about and use exercise, food, even your day job. There are no barriers and no fluff when it comes to WANT – only the ones you decide to put up for yourself. WANT does not advocate one specific lifestyle or approach – it’s all inclusive, open to interpretation and personalization. WANT is that pragmatically positive tool kit, that courageously human hub, that place that takes the idea of “empowerment” to a whole new level – that missing piece we’ve so needed to make magic happen on our own terms. WANT is the purpose project of Katie Joy Horwitch. Meet Katie by clicking though here. Read the WANT Manifesto by clicking though here. Got a question, comment, or just want to say hello? Visit the Contact page by clicking through here. Curious about the fine print? Read our Disclaimers.